If you're a runner, the pounding on your feet and ankles can lead to general soreness of your ankle joints and muscles. Sore ankles can also be the symptom of tight muscles, arthritis, tendinitis, muscle strains or a minor ankle sprain. Stretches and strengthening exercises might help reduce your ankle soreness and prevent future discomfort by improving your ankle flexibility and strength. If soreness is accompanied by swelling and pain, consult your physician before performing any stretches or exercises. 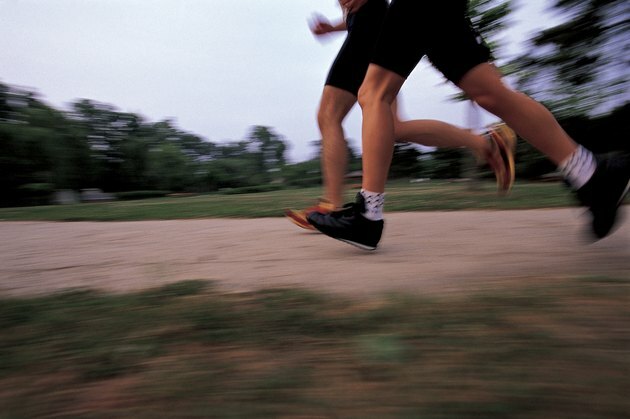 For severe ankle soreness, avoid stretches and strengthening exercises until 24 to 72 hours after running. Instead, rest, ice, wear a compression wrap and elevate your ankles and feet. Take over-the-counter pain medications like acetaminophen if soreness persists. Before stretching or exercising, place a heat pack on the sore ankle to warm the muscles and tendons. If your calf muscles are tight or you have Achilles tendinitis, a standing calf stretch may help alleviate ankle soreness. Perform the standing calf stretch in a staggered stance. Slowly lunge forward while keeping your back heel down. You should feel a stretch in your back calf, Achilles tendon and posterior ankle. Hold for 15 to 30 seconds and repeat one to three times. This is an active stretch performed in a seated or lying position. Slowly roll your ankle clockwise 10 to 15 times and repeat counterclockwise. Perform before and after running to keep your ankles loose and the surrounding muscles flexible. Avoid wearing shoes that may restrict movement while performing ankle circles. Strengthening your calf muscles may help prevent further ankle soreness. Calf raises are performed standing on one foot or with both feet on the floor or off the edge of a step. Raise your heels up with your weight on the ball of your foot and toes. Then slowly lower your heels back down and repeat. Perform two to three sets of 10 to 15 repetitions. As calf raises become easier, add resistance using dumbbells or a resistance machine. To strengthen the muscles around your ankle, perform ankle movements with a resistance band, also called four-way resistance band. Wrap one end of a resistance band around your foot and anchor the other end on a chair or stable object. In a seated position with your leg straight, move your ankle in flexion, extension, abduction or eversion, and adduction or inversion. Perform one to three sets of 10 to 15 repetitions in each direction. Strength Band Training; Phil Page, et al. What Causes Sore Ankles After Cardio Exercise?